SOLD As one would expect from Kenneth Jay Lane, this necklace is bold and meant to be seen! 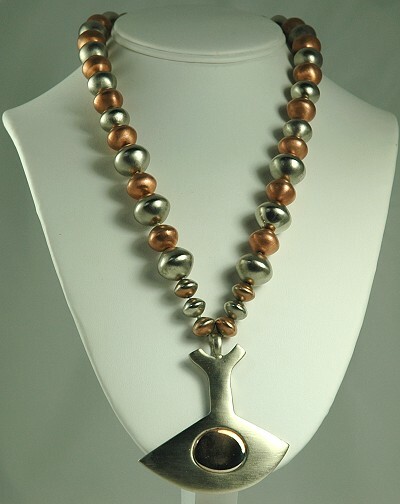 The metal is a mix of silver- tone and copper- tone. The chain is made of small and large beads and the pendant is done in the Modernist style. It is probably from the 1960s- 1970s period. The closure is the barrel type. The hallmark appears on the reverse. Condition: Excellent vintage. The beads are strung on thread and some of the thread is stained. Otherwise, normal and expected wear is noted. Measurements: Chain: 20" long. Pendant is 2 1/2" long and wide.